A year ago, 5-year-old Ava McClelland, born with a cervical spine deformity, would have never been able to ride a horse. "She had a surgery last year to decompress her cervical spine and before that she was walking on her knees and she could write her name and feed herself. And during the surgery last year, in the middle of it, she just lost everything," said Ava’s Mom, Nicholette McClelland. "When she came out of surgery, she couldn’t move even a finger." Today, with the help of therapeutic riding classes and her riding companion, Cadet, Ava gets stronger every day. "It’s something to look forward to and something for her to do when all of her friends are playing ball and stuff, she gets to talk about horse therapy. And that actually makes her friends jealous because she gets to ride horses and they don’t." Therapeutic riding is proven to help develop social skills, decrease isolation, build self-worth, muscle tone, and improve speech. Linda Lake founded Breaking Free nine years ago and believes horse therapy is one of the best available. "We kind of wake up the brain a little bit so that they get more on the thinking," Lake said about the programs offered at Breaking Free. "So they’re thinking about what they’re doing. When a child’s on a horse, they’re thinking about that horse while they’re out there." Most of the horses that come through Breaking Free are donated, but just like volunteers and instructors, they have to meet certain criteria and go through training. Along with behaving similarly to humans, horses establish a bond with the rider. "The first thing they gain is a friend," said Lake. "The horse becomes a friend, a companion. They look forward to being together. The horse remembers that child and the horse responds to that child." 22-year-old Brittani Henderson has been paired up with Bella for the past year. 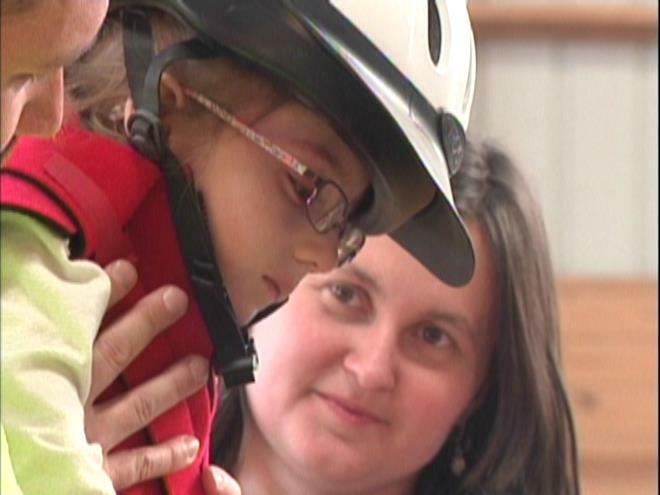 Her father says therapeutic riding has helped remedy the seizure disorder she was diagnosed with as a child. "She’s made a lot of friends here and it just lets her kind of experience and excel in things that sometimes she has a hard time with that. But with this, she’s just able to do what she likes to do," said Brittani’s dad, Jon Henderson. Lake said students with both physical and developmental disabilities enroll in therapy at Breaking Free, but notes Autism surpasses all other diagnoses. Both parents agree the benefits of therapy have been extraordinary for their children. "I’ve had mom’s tell me that their kids are sitting up longer at home now during meals," Lake said of the feedback parents have given her about therapeutic riding. "They’ve been able to actually sit up on the toilet and they’ve never been able to do that before. We’re getting speech, we’ve had some kids with Autism that have been actually began to speak words."